Among my heroes in the history of art, Claude Monet has to be right near the top. Of all of the impressionists, Monet’s work, especially his late paintings, has had the most impact on my own landscape painting. One of the things that is so remarkable about his career is that he continued to grow as a painter until he died, creating works that were quasi-abstract. How many of you still have your students go outside to produce landscapes on the spot in nature? Do you find that students respond better to painting nature when they’re in the middle of it? 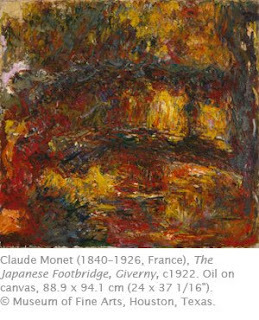 Monet’s mature style was a combination of the influences of the realist Barbizon school painters who encouraged him to paint outdoors; his fellow artists Renoir, Sisley, and Bazille who were all searching for new ways of exploring nature through pure color; and the romantic, atmospheric landscapes of the English romantics Turner and Constable. Monet painted “An Impression, Sunrise.” This painting gave the movement its name. It was displayed in the First Impressionist Exhibition in 1874 in Paris. The emphasis on shimmering light, reflections in water, and use of bright pure color were the antithesis of what academic painting represented at the time, and critics were initially not kind. By the late 1880s his perseverance with the impressionist style paid off. His first big success was at an exhibition in 1889 where he showed his paintings alongside a showing of Rodin’s sculpture. He was well on his way to becoming an established artist. The 1890s was a period during which Monet produced numerous series of paintings. These series were views painted of the same subject at different times of day under differing weather and light conditions. Late in life, Monet’s work focused almost entirely on and around his home in Giverny outside of Paris. There he created a magnificent garden with a Japanese-style bridge and water lily pond. These became almost the exclusive subject matter of his late works. As he reached his 60s and 70s, Monet’s eyesight gradually deteriorated. The works from this period show the greatest amount of fracturing of the form into shimmering reflections of light on local color, some of the works verging on abstraction because of the dissolution of form. Connections Across Curriculum - Artists and their works offer a great opportunity to learn about history and culture. What better place to use art to explore a country or region than a foreign language course? Monet’s garden in Giverny that was such an inspiration to his art can also inspire French language learners. Explore Monet, his art, and Giverny. (The site is also available in English). The French blog “Giverny News” also includes information of Monet’s garden.